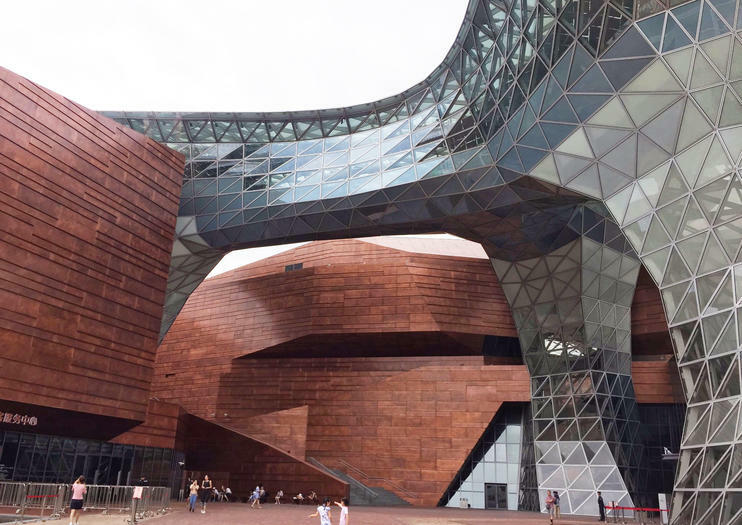 Located on the site of the Shanghai Expo 2010 in Puxi, the World Expo Museum is the only official museum in the world entirely dedicated to World Expos. Eight permanent exhibition halls showcase around 3,000 objects related to the expos, including their history, impact, and future. The 96,875-square-foot (9,000-square-meter) World Expo Museum is housed in an eye-catching structure. Two parts—the glass-paneled “Jubilant Cloud” atop the copper-clad “Historical Valley”—form an interactive indoor and outdoor space, which includes eight permanent exhibition halls, three temporary exhibition halls, a research center, library, cinema, and warehouse. The permanent collections showcase thousands of objects from past expos, as well as videos and multimedia footage, re-creations, and more. The World Expo Museum offers free admission, but tickets are still required. Book tickets online or at the box office. Free luggage storage is available. The museum is wheelchair and stroller friendly, and both can be borrowed for free. The World Expo Museum is located near Lupu Bridge. By metro, take line 13 to World Expo Museum Station (exit 2), or take line 4 to Luban Road Station (exit 2) and then walk about 15 minutes. A number of buses also stop nearby, including lines 17, 18, 36, 45, 96, 144, 205, 733, 780, and 869. The World Expo Museum is open daily except for Mondays. The box office closes 45 minutes prior to closing time. Most people spend around one to two hours here. World Expos are held to highlight nations’ achievements across different fields, such as art and culture, science and technology, social improvements, and economic improvements. The very first World Expo was held in London in 1851. Since then, they have been held every few years around the world and tend to last around six months. Explore Shanghai, China’s cosmopolitan center of commerce, during this 9-hour private guided tour of the city’s history and the innovations of its future. Check out Shanghai’s past, present and future at the Shanghai Urban Planning Exhibition Center. You’ll then take a ride aboard the city’s high-speed Magnetic Levitation (Maglev) train to Pudong to see Shanghai’s financial district and the Shanghai Expo 2010. You’ll also enjoy a traditional Chinese lunch and visit the top of the 1,555-foot tall (474m) Shanghai World Financial Center. Your private city tour also includes round-trip hotel transport by private vehicle and admission to the Urban Planning Center.